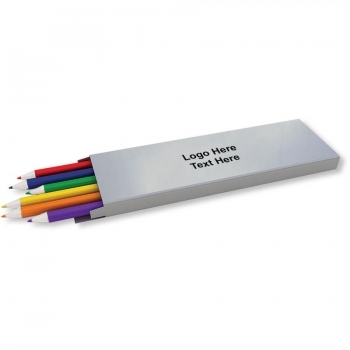 Custom Imprinted 6 Pack Colored Pencils are a great promo items to target both kids and adults. Kids love to draw with these custom pencils whereas adults find these pencils useful for making notes, highlight etc. With a total dimension of 7” L x 1-13/16” W x 3/8” H for the pack, it consists of pencils in Green, Blue, Orange, Red, Purple and Yellow colors. On the other hand the 2" W x 3/4" H imprint space on the pack gives your brand best exposure. Order these custom kids gifts right now to grab our free online proofs and free artwork design services. Request a quote to know wholesale savings for these Custom Imprinted 6 Pack Colored Pencils.